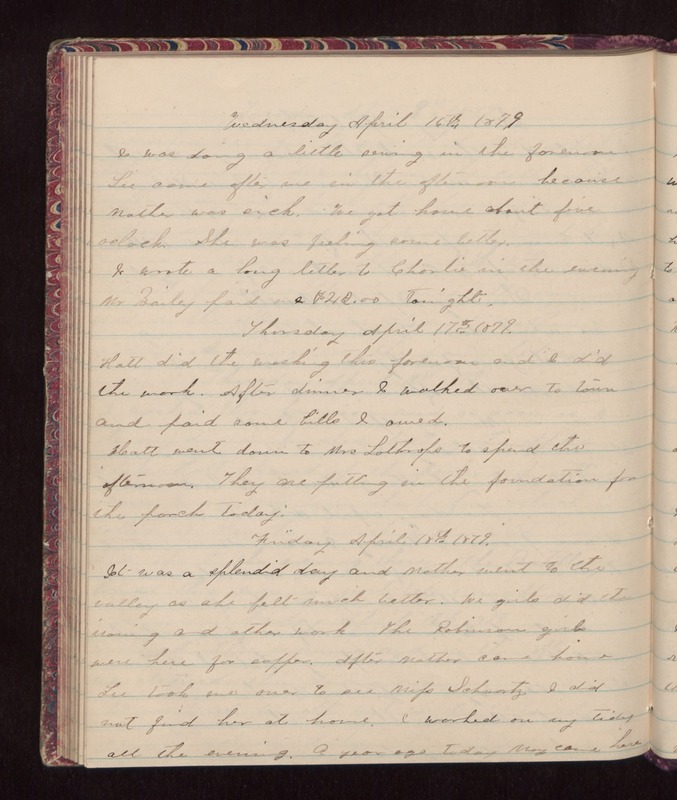 Wednesday April 16th 1879 I was doing a little sewing in the forenoon. Lee came after me in the afternoon because Mother was sick. We got home about five oclock. She was feeling some better. I wrote a long letter to Charlie in the evening. Mr. Bailey paid one $42.00 tonight. Thursday April 17th 1879 Hatt did the washing this forenoon and I did the work. After dinner I walked over to town and paid some little I owed. Hatt went down to Mrs. Lothrops to spend the afternoon. They are putting in the foundation for the porch today. Friday April 18th 1879 It was a splendid day and Mother went to the valley as she felt much better. We girls did the ironing and other work. The Robinson girls were here for supper. After Mother came home Lee took me over to see Miss Schwartz. I did not find her at home. I worked on my tidy all the evening. A year ago today May came here.